Another month has passed and it's time to share my July online income report. With my online income reports, I share how I make money online, what works and didn't work and my expenses. I've been publishing income reports since April 2015. I can't believe this is my third summer writing income reports. Of course, a lot has changed since I started blogging. I feel like I've transitioned from blogger to business woman, which is really exciting! If you are new to reading blog income reports, here's a quick refresher! 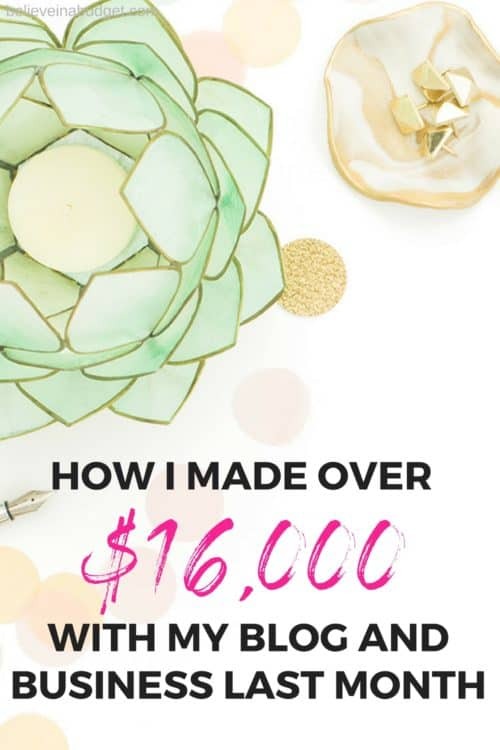 My most popular income report is still my very first one! Two years ago, I published my first income report <ahref=”https://believeinabudget.com/my-first-blog-income-report/” target=”_blank” rel=”noopener noreferrer”>proudly stating how I made $60. Since I started blogging and reporting my income reports, there have only been a few months my income has dipped down. For the most part, my income has grown over the past two years, which is super exciting. I consider my overall experience with blogging and my online business totally worth it. I really like going back through all of my online income reports to see what worked and didn't work. One of my biggest concerns going into the summer months was if my traffic and income was going to tank! I'll be honest – things did slow down. Some of this was intentional, as I was mentally ready for a break. I also was feeling comfortable with my income earnings. Sometimes I put this pressure on myself to keep working harder to earn more money, but really, I was ready for a break! I highlighted my July 2015 and July 2016 above to show you my progress these past two years. July was a really interesting month in regards to spending. I spent a lot of time thinking about my business. I reviewed a lot of the systems I had set up in place, outsourced some work for some one-off projects and made a few big purchases for my blog and business. $1,965 New Apple computer. I'm not sure how I've made it this long on my laptop, but my desktop is now my new favorite thing. It's so big. It's amazing how well I can see too, ha! $0 SamCart I have an annual plan. This is my #1 favorite checkout / credit card processor and it pretty much paid for itself within a few weeks of purchasing. It's made the checkout system was faster for customers, and also the easiest way to set up affiliates. $0 Quickbooks Self Employed I track all my biz expenses and my accountant has access to the software as well. $0 Bluehost. I pay for my hosting annually. This is the company I used when I first started my blog and still use today! Here’s some ideas on what you can blog about and a tutorial on how to start your dream blog. I still have to deduct around 30% of my income for taxes as well. This also doesn't include about 3-5% in fees I pay using Stripe and PayPal. I took Elite Blog Academy in 2015 – this was the very first course I ever purchased. To this day, I've only purchased a handful of courses and this one definitely helped me get on the right path. If you want to learn more about Elite Blog Academy, you can do so here. I really enjoyed taking it easy in July. I really needed some down time, especially since I know August will be pretty crazy with prepping for the next launch of Become a Pinterest VA TODAY! How is your summer? Are you working hard or taking some time off?